In my daily work, I speak to many retailers who are looking for new software solutions to run their business. Most of them start looking for new technology with two goals in mind: they want to increase the shopping experience for their consumers, and they want to simplify processes throughout the organization. Efficiency, simplicity and an improved customer experience seem to be the three key factors that can justify the big investments and changes that a new software implementation brings about. Retailers are experiencing extraordinary pressures, from multiple directions. On the one side, big brands are using their diverse product offering, large capitals and sheer market share to utterly disrupt the market. With its Prime membership, Amazon has created new standards for speed and ease of delivery, transforming the whole market as a result. At Walmart, robots can identify out-of-stock items locate incorrectly priced products, detect wrong or missing labels – and even greet customers at the entrance. Big players have the power to radically transform consumer expectations, while also delivering services in a way that differentiates them from their competition. From the opposite direction, customer expectations are increasing, too. Shoppers are knowledgeable about products and demanding: in a nearly unlimited range of brands, they will only stay loyal to the ones that deliver the most unique experiences. To create loyalty, retailers need to bond with customers. That means going beyond the purely transactional moment of buying and selling, and creating a relationship that focuses on more than financial benefits. To ensure that consumers will be there even when times get rough, retailers must build deep commitment and loyalty. But how can you build such a relationship? Retailers have been using loyalty programs to bind consumers to their business. However, not all of these programs hit the mark of delivering benefits while guaranteeing loyalty. As a matter of fact, the retail market is saturated with ineffective loyalty programs which are expensive for brands to execute, and don’t live up to consumer needs. To be effective, loyalty programs need to be built thinking about consumer needs. This requires a strong knowledge of one’s consumers, and the ability to empathize with them. It also requires brand to differentiate themselves from the competition by developing a strong identity. A study by Euclid, a spatial analytics platform, revealed that around 50% of consumers aged 40 and under feel that it is important for them that their values align with the brands they like. What types are your customers? To deeply understand what customers need, you need to start by looking at how they make decisions. Simply put, our brains process things in two separate ways: a logic-driven one and an emotional one. When it comes to taking decisions, the emotional brain is the one steering the boat. The logical brain only comes in afterwards, when we try to justify to ourselves that the decisions we made using our guts were, actually, very sensible. All consumers share the tendency to make emotional decisions. However, in many other ways shoppers can behave quite differently from one another. Psychologists have identified multiple types of consumers, with each type displaying different preferences when it comes to loyalty programs. For instance, some people enjoy receiving emails or letters with special offers. Others find gratification in working towards a certain goal, for example filling up a loyalty card to get a free product. Forrester identifies three different loyal customer personality types: Hoarding Heroes, Savvy Spenders and Fast Fanatics. Hoarding Heroes’ focus is on maximizing the value of their rewards. They are otherwise not very interested in the products they buy or brands they choose. Savvy Spenders are focused on finding the best opportunities to spend their points. Like the hoarding heroes, they are very interested in rewards. Unlike them, they also care about the products and brands they buy. Fast Fanatics simply enjoy getting free stuff, so they try to obtain as many rewards as possible, as often as they can. Each of these customer types displays a different type of loyalty. Let’s call them traditional, behavioral and emotional loyalty. Traditional loyalty focuses on economic incentives such as discount points and sales. Consumers in this group stick to brands based on the incentives in the reward system. When the incentive shrinks, they will switch their allegiance to another brand. Behavioral loyalty is built on convenience and history. These are consumers who are driven primarily by habit, and tend to be resistant to change for the simple reason that it’s easier to stick to tried and tested products and brands. They may, however, switch their allegiance if other incentives arise. Emotional loyalty is at the heart of customer retention. Emotionally loyal consumers identify themselves with the brand, and get a positive feeling from being part of a community of like-minded people. This type of loyalty creates the strongest bond, and guarantees long-term commitment. Different personality types tend to display different types of loyalty. Let’s look back at the categories identified by Forrester. Fast Fanatics will tend to be satisfied with traditional loyalty programs, as their main goal is to collect as many points as possible and exchange them to get as many rewards as possible. Hoarding Heroes tend to display a behavioral type of loyalty: they are patient, and see the benefit of sticking with a specific retailer to eventually reap bigger rewards. The most interesting group for retailers are, without a doubt, the Savvy Spenders. These consumers are not just there for the rewards; they also show an interest in the products, and in the brand’s message and vision. Here is true potential of developing emotional loyalty. If you do your job, these are the consumers with whom you can build a lasting relationship. Traditional loyalty programs can work for specific types of shoppers. But customers are changing, and so is the retail space. Pressures from all directions will just keep on intensifying. To secure repeat business and true loyalty, retailers need to focus on developing emotional loyalty wherever possible. This will require designing experiences that build a sense of community, trust, and belonging for the consumer. Achieving this level of loyalty requires retailers to start thinking contextually about customers. This means analyzing one’s customers, looking beyond basic personal data such as name and gender to dig deeper into variables such as family background, interests, friends, careers, spending habits. This information should then be used to identify loyalty personas specific to each brand. Having the right data and knowing how to analyze it is the key to a successful loyalty strategy, today and in the future. If you want to know how you can build a successful loyalty strategy, stay tuned! Can’t wait? Then contact me, I can help you develop a loyalty program that delivers benefits to both your business and your consumers. 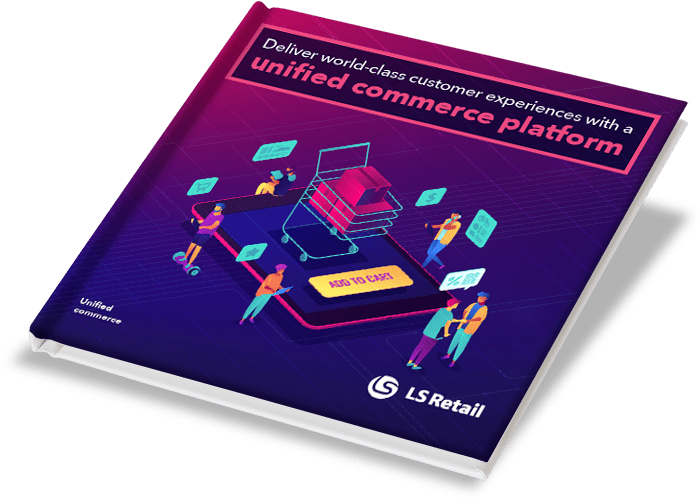 Learn more about unified commerce, the software solution that can solve all your issues of visibility, data consistency and personalization.